From 1914 to 1915, Lassen Volcano had more than 150 eruptions. On May 19 1915, the mountaintop finally exploded pouring lava into the 1914 crater. Eruptions of steam, ash, and tephra continued until June 1917. Since 1921, it has remained quiet and the park was designated to preserve its natural beauty and deep history. Proclaimed as Lassen Peak and Cinder Cone National Monuments on May 6, 1907, Lassen Volcanic National Park was established on August 9, 1916. Wilderness designated on October 19, 1972. The park is open year-round but keep in mind that road access in the park is restricted due to snow coverage fall through late spring. The best time of the year to visit the park for hiking and scenic drives is August and September. If you are looking for cross country skiing and snowshoeing, plan a trip in January, February and March. Northwest Entrance: From Redding, CA: The entrance is approximately 50 miles east on Highway 44. From Reno, NV: The is approximately 180 miles west via 395 and Highway 44. Southwest Entrance: From Red Bluff, CA: The entrance is approximately 45 miles east on Highway 36 From Reno, NV: The entrance is 160 miles west of Reno, Nevada via 395 and Highway 36. Butte Lake: Access to the Butte Lake area is via a dirt road off Hwy 44 east of Old Station. Juniper Lake: Access to Juniper Lake is via a partially paved road north of Chester off Hwy 36. Warner Valley: Access to Warner Valley is via a partially paved road north of Chester off Hwy 36. Follow the signs to Drakesbad Guest Ranch. The nearest major airports include Sacramento, CA (165 miles away) and Reno, NV (180 miles away). A vehicle pass is required for all vehicles entering park. The cost is $10 which is valid for 7 days at the park, as well as Whiskeytown Recreation Area. For those visitors traveling by foot, bike, or motorcycle, the fee is $5. If you plan on visiting the park more than once during a year, you may want to consider getting an annual pass to the park. For $25 you will have a year to visit the park and Whiskeytown National Recreation Area as much as you want. Passes may be purchased as park entrance stations mid-May through October. During other times, passes may be purchased at park entrance stations on weekends only, or at park headquarters in Mineral midweek. The pass is also available on-line or by mail. If you already have an America the Beautiful pass, the entrance fee will be waived. There are more than 150 miles of hiking trails within the park, as well as eight campgrounds. Other activities include birdwatching, boating, kayaking, fishing, horseback riding, and ranger-led programs. Winter activities (typically November-May) include snowshoeing and cross-country skiing. The 2,650-mile Pacific Crest National Scenic Trail, which runs from Mexico to Canada through three western states, passes through the park, offering further opportunities for long-distance hikes. The park also offers a wide variety of Ranger-led and Junior Ranger programs throughout the summer and winter seasons. A schedule of events is available at the official NPS site. 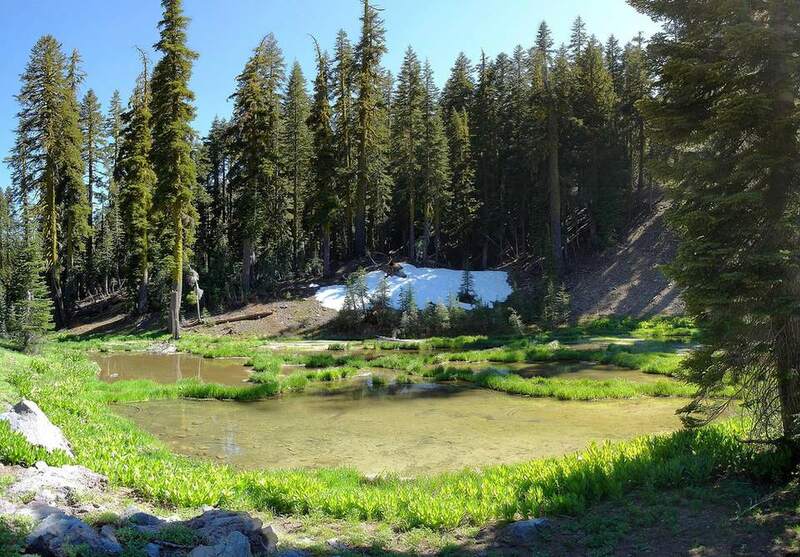 Lassen Peak: This strenuous hike offers stunning views of the Cascade Mountains and the Sacramento Valley. At the top of the mountain, it’s easy to picture the devastation of the 1915 eruption. Bumpass Hell: A shorter 3-mile (round-trip) hike to the park's largest hydrothermal (hot water) area. Main Park Road: This road offers an opportunity for a scenic drive, access to several of the most popular hiking trails, and grand views of Lassen Peak, Brokeoff Mountain, and the Devastated Area. Brokeoff Mountain: If you are a bird watcher, check out the peaks between Brokeoff Mountain and Lassen Peak for over 83 species of birds. Eight campgrounds are available for visitors. All have a 14-day limit except Summit Lake-North and Summit Lake-South, both of which have a 7-day limit. Most sites are open from late May through September and re available on a first-come, first-served basis. Campers interested in spending a night in the backcountry should obtain a free wilderness permit at any contact station during regular operating hours. You may also request a permit in advance (at least 2 weeks) online. Within the park, visitors may also stay at Drakesbad Guest Ranch for a secluded getaway. Pets under physical restraint are permitted overnight in developed campgrounds. Pets are not permitted on trails, boardwalks, in the backcountry, or in any body of water. These regulations do not apply to Seeing Eye dogs accompanying visually impaired persons or other guide animals for disabled individuals. Be sure to ask at the Visitor Center or the Loomis Museum about trails outside the park where you can hike with your pet or for a list of pet boarding facilities in the area.